Hakuba is located in the northern part of the Japanese alps which is the largest national park in Japan and considered to be the mountaineering and hiking mecca of Japan. There are hundreds of trails criss-crossing the mountain range and hikes ranging from short walks to multi day expeditions. The resorts of Happo, Goryu/47, and Tsugaike are open all season and offer a convenient entry point to higher altitudes. Happo Ike. Happo pond is a small pond situated at over 2100m on the crest of the ridge leading down from Karamatsu Dake. Amazing views of The three biggest peaks in Hakuba, Yari, Shakushi and Shirouma can be seen reflected in the water of the pond on a clear day. It takes about 40mins walk from the top lift of Happo to get there. Tsugaike. At about 1900m altitude, above Tsugaike ski resort there lies a high flat boggy area. In May after the snow melts the Mizubasho flowers and the whole area is carpeted in white. You can also see the unusual sight of fully leafed trees surrounded by snow in late May/early June. In summer the Nikko-Kisuge flowers and this time the whole place explodes with gold. The bog is reached by a20minute walk from the top of the Tsugaike ropeway. Kotoomi. This hike starts at the top of the Goryu resort gondola and follows the ridge up past Jizo no atama and the Jizonuma marsh where wild flowers bloom in July and August, finally climbing up the ridge to the summit of Kotoomi at 2009m. From the top there area mazing views of Kashimayari dake and Goryu Dake. Karamatsu Dake. A three or four hour walk along the ridge from the top of Happo ski resort takes you to the summit of Karamatsu Dake(2696m). The path leads past a small pond called Happo Ike with great views of the Hakuba peaks and then up through open birch groves, past some eternal snow fields until finally you arrive at the summit. The view from the top is outstanding. To the east Hakuba is laid out like a map far below. To the west is the spectacular peak of Tsurugi Dake and the Japan sea beyond. Between Karamatsu and Tsurugi lies the deepest canyon in Japan Kurobe canyon and to the south countless peaks stretch away to the horizon. On a really clear day Fuji can be seen away to the south west. The three Hakuba Peaks and the snowy valley. This can be done as areally long day but is probably better split into two with an overnight stay at one of the campsites or at the Shirouma Dake hut.The route includes a walk up the Daiseki gorge which is full of perennial snow, followed by an ascent of the three highest peaks in Hakuba, Shirouma(2903m), Shakushi (2), and Yari (2) and ends with a descent past the highest onsen in Japan Yari onsen at 2100m and back to the starting point. Kurobe gorge. This is a mostly low-level walk through the guts of the Kurobe gorge. The Kurobe Gorge is the deepest Gorge in Japan.The mountain walls on either side rise to 3000m and the floor of the gorge plunges to 1500-2500m below. The route starts from Unazuki onsen. A train ride takes you along the first part of the gorge through beautiful scenery to Keiyakidaira where there is a visitors centre. From there it is a long days walk through the deep gorge crossing subsidiary rivers on huge snow bridges left over from big winter avalanches. Eventually you end up at Kurobe dam, the biggest dam in Asia (until the chinese three gorges dam comes into operation). From there you can return to Hakuba by a trolley bus cut in a tunnel that goes right through the mountain range or by high level walking trails through the mountains. There are too many other walks around Hakuba to mention here! Mountain biking season is from Golden week until November. There are also some amazing trails to the south in Matsumoto which can be ridden from March. There is great mountain biking in Hakuba. A variety of trails loop along both sides of the valley through mixed forest and up and down ridges and across rivers. the trails range from technical singletrack to swooping singletrack through meadows of mountain flowers, to rock gardens, rollercoaster berms, drop offs, you name it! Iwatake, Hakuba 47 and Aokiko and soon Happo all offer lift access to mountain bikes and a range of courses. Aokiko especially has a range of fantastic technical singletrack courses with all sorts of riding graded for difficulty. We have along with sweetriders (www.sweetriders.com) built some north shore style bridges and drop offs in an area called the garden of pleasure where a lot of the Aokiko trails converge. Many a happy afternoon can be spent trying out the challenging to downright scary bridges, ramps,drop-offs and jumps! Bikes can be rented from Evergreen www.evergreen-hakuba.com, sweet riders www.sweetriders.com. Canyoning can be described as walking, climbing, rappelling,jumping, scrambling, and swimming down canyons, waterfalls and natural pools and is quickly becoming one of the most popular activities in Hakuba! This is a fantastic way to immerse yourself in Hakuba‚s natural beauty and to have a lot of fun! Our neighbours, Evergreen Outdoor Center offer half-day tours(8000yen/adult 7000yen/kids) with professional instructors who’ll guide you up and down Hakuba‚s pristine waterways. Canyoning season is from Golden week until November. One sport that’s recently taken off (pun intended) in Hakuba is paragliding. Paragliding is a recreational and competitive windsport that can best be described as a hybrid of hang gliding and parachuting. The pilot sits in a harness and launches by running and jumping off hills, ridges and mountains. Shifting your weight and using breaksto steer, an experienced paraglider can ride the wind currents for acouple hours at a time. The endless peaks, ridges and inclines in the Hakuba valley provide the perfect paraglider’s playground. And with fully-trained reasonably-priced schools like “JMB” in Hakuba, anybody can do it!There are tandem jumps with a professional instructor for the complete beginner (half-day 5000yen/full-day 9000yen) as well as a whole range of advanced courses for the more experienced. Paragliding season is from Golden week until November. Click here for more information on Paragliding in Hakuba. The surrounding peaks, rugged valleys and melting snow make for great conditions for whitewater sports. April through June is the best time to to go while the melting snow pack fuels the rapids. Or for a more gentler approach try a kayak or canoe on one of the valleys’ fresh water lakes. There are a few tour operators in town who cater to the whitewater enthusiast. At “Evergreen” you can even buy a package combining a day on the river with a number of other activities like mountain biking or rock-climbing. 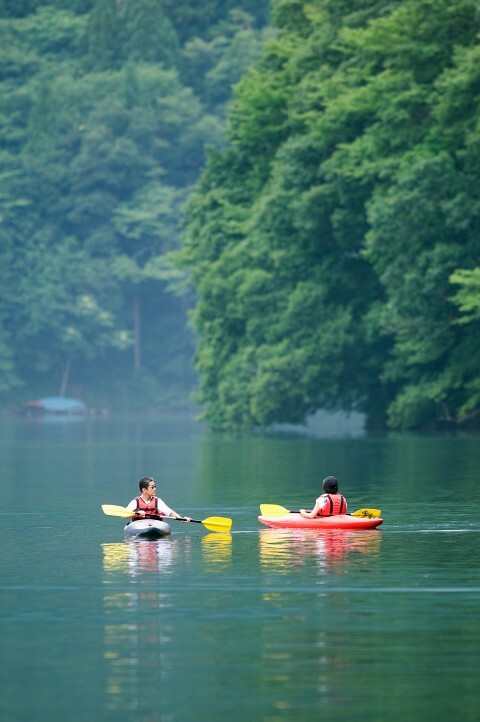 Lake Aokiko is a beautiful fresh water lake surrounded by forest. The lake is spring fed.